From 1820 to 1860, almost 2 million people left Ireland, many due to the potato famine in the 1840s and 1850s. More followed in the 20th century to reunite with relatives and escape poverty and joblessness back home. Once settled, they found new ways to celebrate St. Patrick’s Day and their Irish identity in their new homes. Irish-Americans, especially, were quick to transform March 17 into a commercial enterprise. The mandatory “wearin’ of the green” in all its garishness is a far cry from the original tradition of wearing a spray of shamrocks to honor St. Patrick’s death and celebrate Irish solidarity. 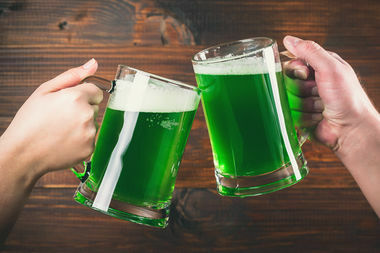 Parades famously sprung up – especially in New York and Boston – revelry ensued and, sure enough, even the beer became green. Children of Irish-Americans in the United States have absorbed Irish culture at a distance. Many probably know that St. Patrick is Ireland’s patron saint. But they might not fully appreciate his mythic stature for kids growing up on the emerald isle. Ask children of any age in Ireland what they know about St. Patrick, and they will regale you with stories of his magical abilities, from his power to drive the snakes out of Ireland to his use of the three leaves and one stem of the shamrock to demystify the Trinity doctrine of the Catholic Church. They see St. Patrick as a miracle worker, and as adults, they keep the legends alive in their own ways. Some follow St. Patrick’s footsteps all around Ireland – from well to hill to alter to chapel – seeking his blessing and bounty wherever their journeys take them. Of course, in America, the holy day is really a party, above all else. Where all of this leads is anyone’s guess. But beginning in the 1990s, Ireland seemed to grasp the earning potential of the Americanized version. Today, March 17 remains a holy day for the natives and a holiday for tourists from around the world, with pubs raking in the euros on St. Patrick’s Day. But I’ve always wondered: What if St. Patrick had requested a silent prayer instead of “a wee drop of whiskey” to toast his passing? Would his celebration have stayed more sacred than profane? James Farrelly is a professor of English at the University of Dayton.